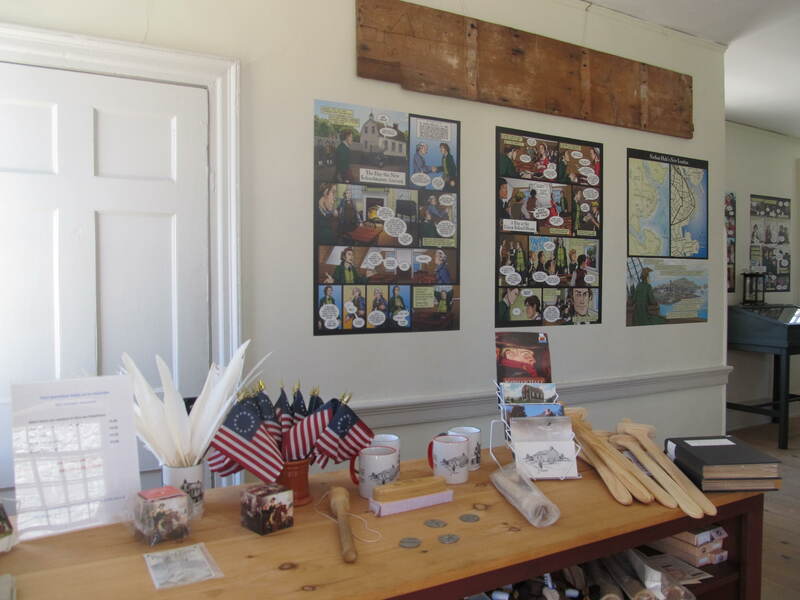 For the past two Saturdays, I've had the delight of visiting small history museums in Connecticut. I visited Branford's Harrison House, which is a colonial home and museum, and wrote it up for my column in Branford Patch. The following Saturday, I headed out with my friend TJ to New London's Nathan Hale Schoolhouse, where a young Nathan Hale taught. I will admit that I know more about Nathan Hale since I started reading Lora Innes's The Dreamer than I had prior, in part because she inspired me to grab some revolutionary history off the bookshelves at the library and look him up. The reason we hiked out to New London on Saturday was because Lora was there in person, doing a presentation on her new graphic exhibit featured on the museum's walls. Lora talked about how historical fiction is a gateway into history (clearly, it worked for me). The Schoolhouse is small -- only two rooms -- but it's recently been restored, so it gives a feel for just how it would have been when Hale was teaching, and discovering his love for teaching. In the (very warm) upstairs room, the previous exhibit about spies during the American Revolution held our attention while we waited for the exhibit opening to begin. Of course, the Culper Ring (one of the most important spy rings of the Revolution) was mentioned, so I texted Arielle Kesweder, who, along with being one of my first-readers, is a in tune with all things geek culture, and asked her in what comic I'd heard of the Culper Ring before. (Answer: Y: The Last Man -- which further proves Lora's point about fiction opening doors to history.) 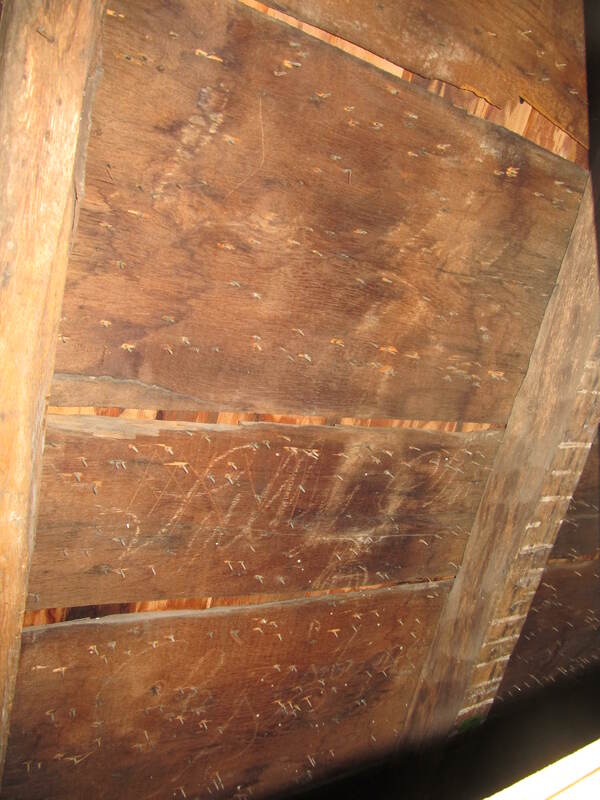 The upstairs also revealed chalk drawings dating back to the Revolutionary period, including this one that is likely of the privateer ship, Nancy. The presentation began promptly at two with an introduction from state historian Walt Woodward, who celebrated the exhibit team's (Jennifer Eifrig, Stephen Shaw, Rachel Smith, and Lora Innes) approach to introducing Nathan Hale as a human, rather than a hero. A lot of people only bother to remember Hale for his failed spy mission and subsequent execution, but insight into his days in New London show a man who would have been a teacher, a husband, and a father had he lived long enough. Lora was up next, discussing how fandom brings a huge amount of enthusiasm not just for media, but for history. In fact, several other The Dreamer readers were there, including a librarian from just a few towns over (Lora introduced us and gave the two of us a chance to bond as grown up comic readers and history nerds). I haven't mentioned my column on Branford Patch recently, though it's currently the most consistent place you can find me online (or in any published venue, now that I think about it). But before it gets too far buried in the column's archives, I wanted to point out the last pair of articles on a "Then and Now" feature: "Then and Now: The Year(s) The Sound Froze?" has my very favorite picture from the Branford Historical Society's photo archives, the image of a car parked on Long Island Sound, out among the Thimble Islands, when the Sound froze in 1934. (The article itself asks for guesses about the year in the image; this past week's column provided the answers I mention here.) At any rate, this is the first time that image has been available online, and because I love it, I think y'all should go over and look at it. Attempt number two at posting: I don't know if it's having so many tabs open (with links I've been collecting to share here) that's making Chrome slow down. I'm also not sure how my last livejournal tab got closed before posting (though that could have just been my slippery fingers). But I figure I'd better share some of this stuff and see if that speeds up my work process on this end. In Reads takes a look at the Amazon royalty structure for Kindle books, and questions whether the cut off point for high royalties at $2.99 is fair. (Books priced between $2.99 and $9.99 receive 70% royalties; below $2.99 they receive 35%.) With Amazon pitching a new tablet to compete with the iPad, I bet we see this type of conversation keep cropping up. When the agency model first came out, I, and others, questioned who was benefiting. From what I knew from working with physical books at a bookstore, the publisher sets a cover price, charges retailers a percentage of that price, and the retailer decides how to price it to best sell the books to their customers. The agency model takes away the retailer's options to price the book for their customers -- which looks to me like it's shorting the consumers. I couldn't figure out the benefit to the publishers for this, but apparently, it's that they could sell their books to Apple. And now, according to Business Week, Apple and the publishers who have embraced the agency model are facing a suit for e-book price fixing. So my feeling that there was something fishy about the model is not a unique thought! A writer for the Guardian asks, again, if e-books are ushering print out. According to the commenters, the answer is still no. Via Rob Schmidt from Newspaper Rock, National Geographic tested the representation of the Apache in the Cowboys and Aliens movie. Some of the things I mentioned in my review came up; other things they caught I did short pieces on in the history bits of C&AII. For example, War Hawk (who doesn't have a traditional Apache name) talks a little about naming conventions here. Apache names reflected something about their personal nature, and during the time in which C&AII is set, a lot of those names began with "Angry." I can't track down my original sources on that information, but photographer Rico Leffana wrote about some of that same history in a short essay on Fort Apache. In the meantime -- plenty of writing and editing work keeping this Abbott busy! On the fun side, Bug and I both went on our first ride on the electric trolley, which I've written about briefly on Branford Patch, and had a great time. I've been edging on that 30 messages in the inbox mark for the last three days. I just jumped back up to 35, and while I may be able to narrow it down by one more tonight, I don't think I'll get any closer to success between now and tomorrow morning. The flow of work just keeps coming to me, and I'm grateful, if busy. This doesn't mean I haven't found any ways to procrastinate just a tad. The evil Arielle Kesweder (you know, one of my beta-readers? usually saintly? yeah, now evil) introduced me to Angry Birds for Chrome. I'd thought I didn't have the technology to experience the Angry Birds for myself, and was doomed to pop culture references that went over my head, but no, she had to show me the error of my ways. Luckily, while it's clever, it's not quite as addictive as, say, Plants vs. Zombies, so I think I'm safe. Tomorrow is check in day for Kaz's Spring into Summer 50K writing challenge, and yet again, I've nothing to report. Summer camp was so good to me last year that I really want to accomplish something with the new SIS project. But tomorrow is also the day when I'm going in to talk to local elementary school students about writing and Branford history, and that seems like the more important priority for the day. But back to the subject: something I've discovered about myself as a writer recently is that when I offer up a piece for critique too early, I lose motivation to work on it. My brain switches gears from writer brain to editor brain, and I start looking at all the things that need to be fixed rather than what needs to happen *next. * Both Blackstone Academy and East Wind are currently suffering from early-critique syndrome. On the other hand, I don't like to write in a void. I like to know that someone is out there reading what I'm writing and wants to read more. It helps keep me motivated to think that people are hanging on at the end of a chapter waiting to see what happens next. To synthesize these two things, I decided to create a group that I'm calling my Pep Squad. Their job is to be excited about what I send them (even if they're not). They're so early in the reading process that they're not even alpha-readers -- they're the pre-alpha-readers. I've got a team of four friends who are taking on this role for me, and I've just sent them some pre-writing tonight for a new project I'm tentatively calling Liminals. In other news, counting review books, several volumes of Schlock Mercenary, and manuscripts, I've read 49 books so far this year. I'm just slightly proud of that number, given that we're only in month four of the year. 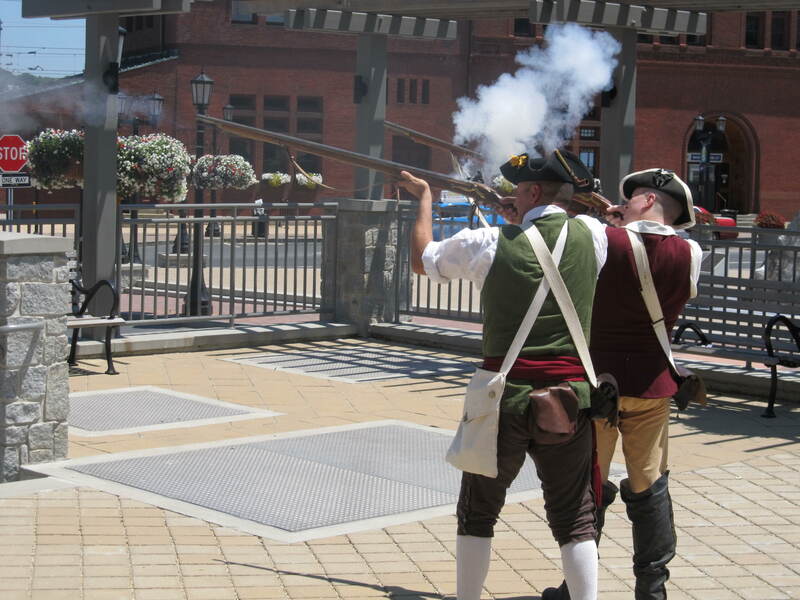 My second article for "The Town with Five Main Streets" went live today! It's all about the founding of Branford, CT, and dips into an interesting bit of history about how there was no difference between church and state here back in the 1600s. Please drop by and comment, if you feel so inspired! In other news, I just heard back from Alayna Williams, and Beverly Gordon is our winner! I'll be in touch to make sure we get your address and etc. Hope everyone had a happy Tuesday. I finished Poison Throne today and, rather than move straight into the second book, I'm starting Kage Baker's The Anvil of the World. I figure, if I don't get into it in my usual time frame, I can take the whole trilogy back to the library tomorrow when we go for story time. If I do like it, then I'll have another series I dig and want to finish post haste! In other news, how did it get to be Wednesday already? What's special about today? Well, my first "The Town with Five Main Streets" column post at Patch.com is live! It's an intro post about what we expect to cover in the ongoing column. Please pop by and check it out -- leave a comment if you feel like it, and I'll say hi there as well as here! I finished up a copyediting project earlier than expected, much to my surprise, and I'm trying to figure out what my priorities are at this point so I can get some work done before celebrating Bug's first Christmas. :) I've got a "Five Main Streets" article to write, a review that needs to get done and some others I'd really like to get off the shelf, a short story to finish, and studying to do. All I need now is to prioritize! I went to a convention one time where, when a friend sharing the room with several of us woke up, he said, "Can't brain today. I has the dumb." Apparently, he did not make up this phrase, but since he was the first place the rest of us heard it, we attributed it to him. I had a recharge day today, reading a review book and hanging out with Bug. I have copyediting to tackle, but I spent Saturday cleaning the basement (it oh-so-desperately needed attention) and Sunday writing the first article for a new history column I'll be doing for Patch.com. (The site, Branford Patch, launches the end of the week! I believe my first article goes live on the 22nd -- the column is "The Town with Five Main Streets." You'll see it mentioned here!) I did have a nice break with my friend Leifr on Saturday night, but today I still felt the need to give myself permission to recoup. And to continue that trend, I'm off to bed. Hopefully, tomorrow I will be good at braining.